Got the car back after it being away for 3 days at the powder coaters, god i missed it not being at home. Anyway it was definitely worth the the wait and the £290 as they look like they would have 17 years ago. 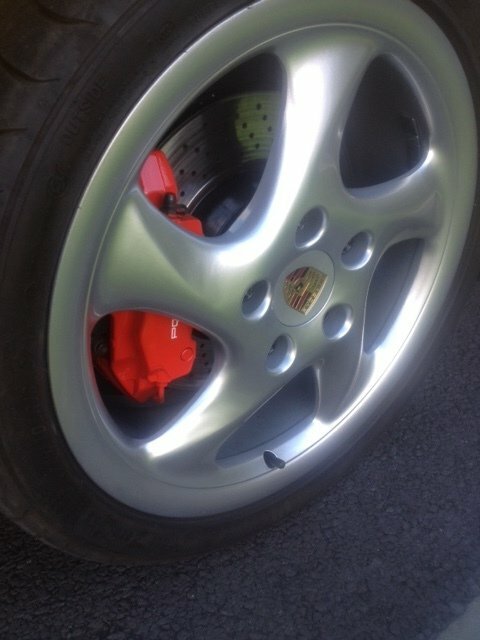 Along with my recently repainted discs and callipers it looks fab. This is a terrible DIY Project Guide. There is a general discussion forum, in case you didn't realize. Last edited by particlewave; 08-09-2017 at 11:58 PM. Your completely correct, thank you for your guidance, I cannot believe iv been so silly. Just thought i would educate you on the proper alignment of the crest, the devil is in the details. I point mine to the valve and they rotate away the next time... I haven't installed my custom ones from Fred yet, I bet those won't rotate! I thought making sure light switch screws were always vertical was OCD enough. Need to step up my game. My ocd stretches to great lengths. For instance in my old car i used to turn all the fan switches to vertical no matter what before i left the car.